Fifty-five years–WOW! It will be great to see old friends and classmates. Let’s see–what have I been doing since high school graduation? Since my retirement in 2001, I have kept busy with volunteer work, painting, home improvement stuff and grandkids. Between my wife Joan and I, we have five sons, two grandsons and five granddaughters. Joan and I provide full-time care for our special needs grandchild, Sarah. That in itself keeps us very busy. As noted, I continue to paint which gives me great pleasure and accomplishment–every one needs a hobby. 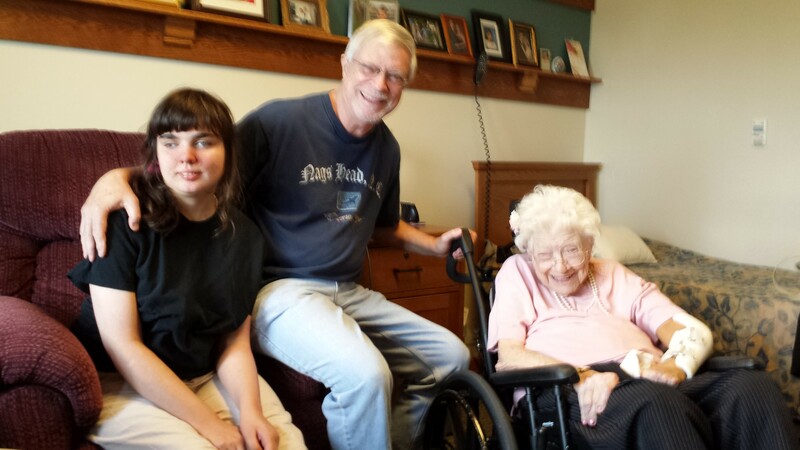 I have enclosed a photo taken in August of this year during a visit to my 107 year-old Mother. While she is very frail, she is still going strong–hard to believe. Sarah is also in the picture. I am enjoying life, feel very blessed and look forward to seeing my old buddies.